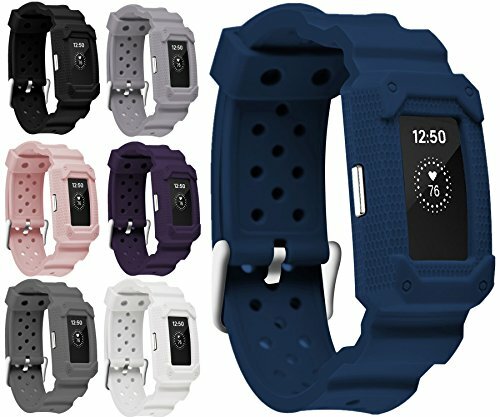 Compatible with Fitbit Charge 2 all Versions (2016 Release), allowing full access to touchscreen, buttons, and ports. Designed with both protection and looks in mind, Moretek Sports Series Full-body Hybrid Case provides shock absorption and scratch prevention while maintaining a sporty profile. - The Moretek Sport Band reduces weight and improves ventilation via row after row of compression-molded perforations. .- Elegant Look,it stays well with the wrist,elegant and Classy dressy style,makes you outstanding everywhere. Notice: The Package comes only With 1 Strap!!! Suitable for military. Made by high quality silicone, it is one of the good elastic material with excellent resistance to UV. Skin-friendly material, Line UV and anti-bacterial, anti-allergy. Reduce the skin allergic phenomenon, good for wearing. Selected from more than 126 materials, which is more fits to the skin. Through the harsh environmental testing, advanced innovation and new technology. Focus on protection, sophistication, safety, protection. Good preservative.In the design, the band is more anti-impact than other strap. Precise holes. Seamless dust, reasonable structure solved the stitching problem in technology. The protective improved 35%. Protect your watch by 360 degree. Impact-resistant 1.2 m. Impact mitigation, give you a strong protection. Frame design can avoid the direct physical impact with the ground. Better to resolve external adverse effects on the screen. Fits to Fitbit Charge 2 . Length about 6.00''- 8.60''. Does not include fitness tracker! Replacement band only! Attention: When charging the tracker, the new kinds band need to be take off ! If you have any questions about this product by Moretek, contact us by completing and submitting the form below. If you are looking for a specif part number, please include it with your message.